J and I haven’t spent a lot of time together recently. Our work schedules seem to be overlapping quite a bit and it’s not uncommon for her to be walking in the house as I’m walking out and vice versa. I got home really late again last night. It was almost 3:00 AM by the time my head hit the pillow. Needless to say, I slept pretty late. When I stumbled up stairs to see what J and L were doing, I found an empty living room. They had gone back to bed for a nap. J heard me and we started a Facebook chat conversation (really common for us) so we wouldn’t wake L up who was still napping. She said when L woke up, she’d like to go out to lunch. Sounded good to me. L woke up about fifteen minutes later, so I picked her up, changed her diaper, and got her dressed. J and I got ready as well. When we got in the car, we still didn’t know where we were going…but we knew we were going somewhere for lunch. As I was pulling out of the driveway, I asked J if she wanted to go to the “other Burdick’s.” The one we hadn’t been to yet. She didn’t really know what I was talking about. She actually thought I was talking about the one that used to be at Wings Stadium. We had tried to eat at that one when the Curling Nationals were in town, but we couldn’t find it and didn’t know when it was actually open. That wasn’t the one I was talking about. I was actually talking about Old Burdick’s at Wings West. 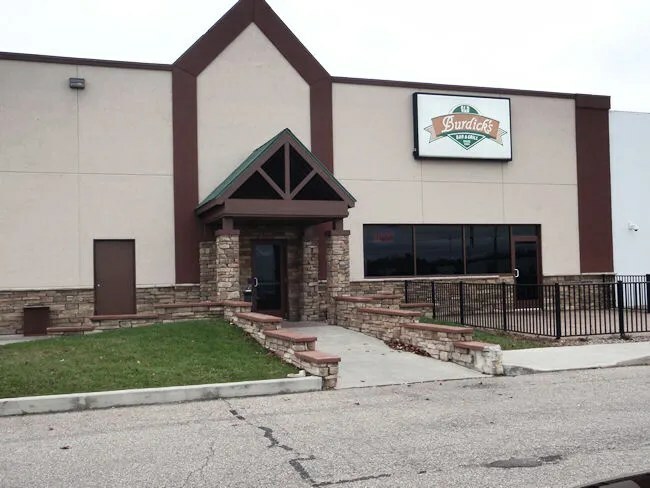 Old Burdick’s at Wings West is, as the name implies, connected to Wings West on Sports Drive just off of 9th Street and N Avenue in Texas Township. The entrance to the restaurant is on the N Avenue side of the building and there’s a large parking lot, that was surprisingly full on a Saturday afternoon. We found a “Please Seat Yourself” sign when we walked in and the bartender reiterated that point as we started walking towards a table. J asked if they had a high chair and the bartender went after one for us. The dining room at this Burdick’s is pretty cool. It’s a typical pub setting and it’s pretty standard Burdick’s decorations. The cool thing is there are large windows overlooking the hockey arena. There are a number of tables right up against the glass where you can watch the action from. There is also a stand up bar that overlooks the arena as well. Our waitress followed the bartender with the highchair with the menus. It’s the same menu as the other Burdick’s locations. By the time she came back with our drinks (Pepsi products), we knew what we wanted. I stuck to my favorite burger. 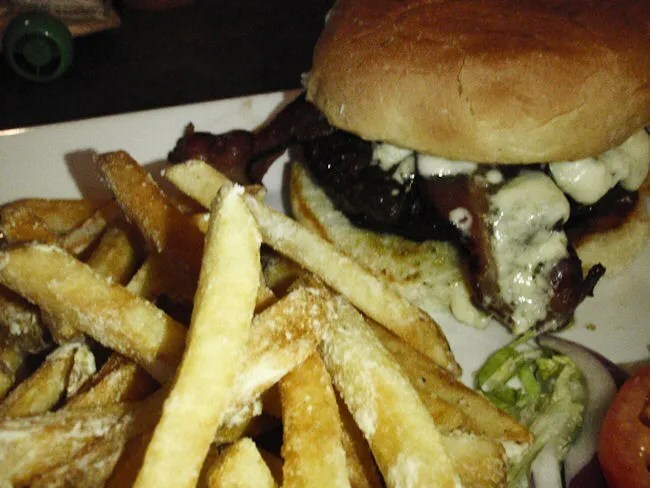 The Bacon & Bleu Burger is Burdick’s flame kissed burger topped with bleu cheese and pecan smoked bacon. I love Burdick’s burgers. 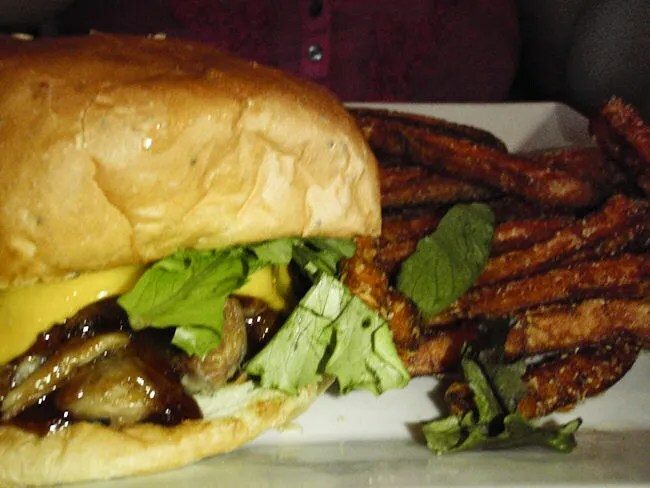 We order very often from Burdick’s West whenever I’m in the mood for a burger and we want to order carry-out. This burger has a large handful of the tangy bleu cheese and two slices of crispy bacon. As always, the burger was delicious. I opted for the Truffle Fries as my side. These fries are Burdick’s skin on fries dusted with truffle oil and white cheddar cheese. Surprisingly, this was the first time I had ordered them. I usually stick to the regular sea salt fries. These were good, but normally, we order Savory Pub Bites with the truffle oil and white cheddar…if we do that, I would stick to the regular fries. J was leaning towards her usual Burdick’s order, the Strawberry Citrus Salad, but opted to go with the Pulled Pork instead. The slow cooked (not smoked) BBQ pork is topped with BBQ sauce, cheddar cheese, and frizzled onions. The pork wasn’t really pulled, but instead, served in large chunks on the bread. J said it was good, but she should have stuck to her salad. She’s a much bigger fan of smoked, thinly pulled pork sandwiches and this wasn’t that. The pork was juicy and tender….but not really her thing. For her side, J chose the Sweet Potato Fries. Her intention was the share with L, but L wasn’t interested. She actually preferred mine. J said they were delicious and she will stick with them in the future should she order a sandwich again. Our bill was just a little over $30 which is actually pretty cheap for us. We usually order appetizers and drinks when we eat at Burdick’s, but we passed on both this time. 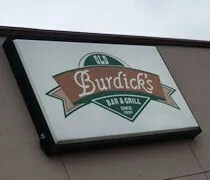 Like the other three Burdick’s locations, we were big fans of Old Burdick’s at Wings West. The restaurants always deliver quality food and a great dining experience. This location is no exception.